I have a shocking confession: I love to read my work in front of an audience. Shocking, perhaps, because so many people hate to be on stage (fear of public speaking is said to loom larger than fear of death). Maybe it’s the long-abandoned theater artist in me. Maybe it’s the thrill of knowing that at least the small number of people in the audience will hear my story. Recently I gave several readings at the San Mateo County Fair and one at a CWC SF/Peninsula Open Mic. I enjoyed doing them and received compliments not only for the content of the stories but for the way I read them. This got me thinking about what makes for a good fiction or poetry reading. I think the most helpful thing a reader can do to ensure a great reading is to act like an actor. I don’t mean dress up in costume and change your voice for each character (although, if you can pull it off, this can work really well). I take my inspiration from the read-aloud series Selected Shorts, which most often uses actors—not authors—to read well-known short stories for broadcast and on stage. 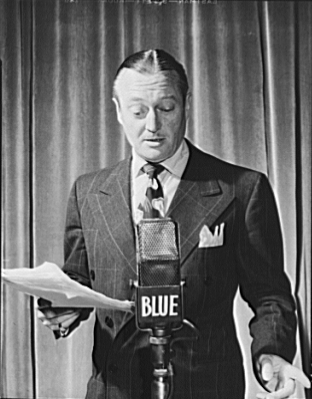 Edmund Lowe, American actor, standing at radio microphone (labeled for (NBC) Blue Network), holding script, 1942. What do actors do that ordinary mortals don’t do? Connect with the audience. Initially I thought my first recommendation would be “project your voice,” but after reading some tips for presenters from a presentation coach, I realized there is more to it than just making sure you speak loudly and clearly. Of course you need to articulate your words. 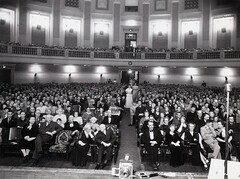 But connecting with an audience also involves feeling comfortable on stage and making eye contact. Consciously vary the volume, tone, pacing, and pitch of their voices. There is nothing more deadly than a fiction reader who sounds like a computer-generated voice. We’ve all heard them—the reader who places equal emphasis on every word and continues for the entire reading at the same volume. Take a listen to some of the Selected Shorts offerings to hear what the actors do with their voices. Rehearse. Yes, you’re reading, not memorizing. But rehearsing—not just doing a single quick read-through—lets you hear where you can improve. And it helps you get comfortable enough with the material so you can lift your eyes from the page for a few beats every now and then to make that all-important eye contact with audience members. Breathe. Of course you’re breathing; the alternative would be dire. But most of us, when anxious, breathe more quickly and shallowly. And we speak quickly, either because we’re nervous or in the mistaken belief that rushing through our reading will be less annoying if people don’t like our work. Speed is the enemy of a good reading. Ideally, your reading voice will be a bit slower than your speaking voice. Think of savoring the words. And if you’ve ever wondered what those commas and period are for, here’s your answer. They. Indicate. Pauses. If you really want to get serious about improving your reading, record yourself and listen to the recording. I happen to detest the sound of my recorded voice (is there anyone who doesn’t?) but this exercise takes rehearsal to the next level. You can note the awkward passages; hear where the pacing drags; and catch where you stumble. I urge all fiction writers to find opportunities to read to an audience. It will make you a better writer. Convoluted sentences or overwrought descriptions can easily slip by when they sit silently on the page. When read aloud for an audience, they will be revealed in all their tongue-twisting, plot-destroying glory, and you’ll be motivated to make your work better. Be courteous. Give your attention to the reader, not to your smartphone or the notes in your purse or the novel you happened to bring along. If you’re a fellow reader, try (I know it’s hard) to resist the temptation to review your own piece while waiting your turn to read. Give your full attention to the reader on stage. If you’ve prepared well, you can forgo one more quick read-through in favor of listening to the other readers—and maybe learning something from their technique. Be compassionate. Even if you’re listening to a well-known author, remember that person probably has anxieties, worries, and insecurities. Send a little love their way. You’ll appreciate when it comes back to you. So, what has been your experience with fiction readings—in the audience or behind the mic? Any links to audio of great readings would be appreciated! Readings are actually my favorite part of public speaking. The only thing I don’t do during a reading is look up. For me, I need to be immersed in the passage. Making eye contact breaks my concentration and reminds me I’m in front of an audience which sets off my nerves. I also remind myself how boring a reading can be if it goes on too long. i try to select 4-7 minute reading passages (I time them to make sure). Four to seven minutes sounds about right. The open mics where I read go up to 10 minutes, and that can sometimes seem really long. On the other hand, if it’s an engaging story and a talented reader, I don’t mind listening for 15 – 20 minutes! Excellent advice. There’s nothing worse than a monotonous or meandering read. You’re fortunate you enjoy reading aloud, Audrey. I hate it! LOL! But these are all good tips, especially the suggestion to practice beforehand. That’s why I led off saying it may be shocking that I like it! Most writers I know are the opposite. I’m glad you liked the tips and I hope you can feel a bit more relaxed the next time you have to read.